9/19/2008 - HSS was directly involved in a government grant to study how to apply Lean and Six Sigma to an anticoagulation clinic. We setup the project using the DMAICR model (Six Sigma methodology), and initially focused on the quality of the data coming from the different labs within the Cedar Rapids (IA) area. 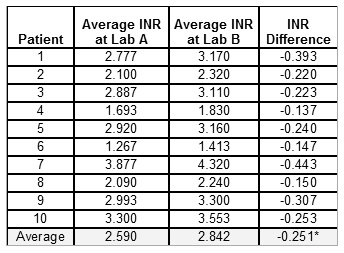 If the INR data is not proven to be valid (not just assumed to be good), it could be causing some of the variation in the INR readings. We used the Six Sigma tool called Gage Repeatability and Reproducibility (R&R) to determine if there were significant differences between the labs. To test this out, we took 10 randomly selected patients. Each patient had his/her blood drawn from Lab A, and the blood was then separated into six tubes. Three tubes remained at Lab A for testing, and three tubes were immediately sent to Lab B for testing. Results showed a statistically significant difference among labs. The therapeutic range for INR is typically 2.0 to 3.0, yet the data showed a difference in INR of 0.4 among labs on a small sample of 10 warfarin patients, almost 50 percent of the range. Root cause analysis revealed that the normalizing number (mean normal prothrombin time, MNPT) utilized in one of the labs varied greatly from other area labs. The team determined a new qualification process for MNPT to keep results consistent across all the labs. Under the new MNPT process, blood samples would be collected within the same group of 'normal' patients using new criteria provided by the equipment manufacturer. The samples would be divided evenly and provided to each lab to collectively set up the equipment and MNPT values at their facility. Labs with MNPT results that differed from the others could be quickly identified and corrected before test results were provided to actual patients. 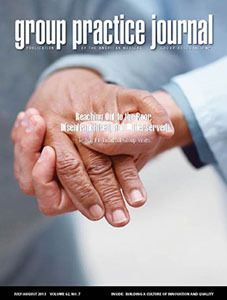 The study also evaluated opportunities to apply Lean concepts to a clinic. The goal of any clinic is to reduce the total time from when the patient is tested, until they receive communication back from the clinic reviewing their results. For this virtual anticoagulation clinic, it was observed that some of the labs "batch" INR results and fax them to the clinic all at one time, or when some predetermined number deemed sufficient are available to be faxed. 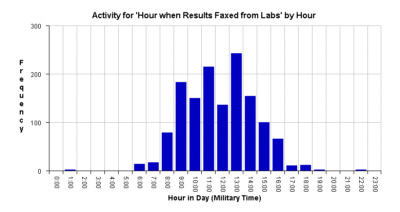 This is commonly done when processes are handed off to another area, because it is an efficient way to minimize the total amount of time for the labs to fax results. However, batching often extends the overall length of time that patients have to wait to receive their results. Batching might be optimal for the labs, but the customer (patient) does not get timely results with this approach. �One-piece flow� is a key teaching point of Lean methodology, since it seems counterintuitive to those working within a given process, yet it is most efficient for the customer. To track the cycle times efficiently, INR Pro was setup specifically to track this information, and provide analysis back to the clinics, to see the overall cycle time for each patient, and determine which part of that process takes the longest. Once identified, various Lean and Six Sigma tools can be employed to reduce those cycle times. Another benefit of tracking this information is to identify whether your clinic resources are properly staffed for the correct time of day when most of the patients (or patient results) arrive. The chart below shows a sample report that can be generated within INR Pro. A 4-volume series of articles from AHRQ was recently released, titled Advances in Patient Safety: New Directions and Alternative Approaches. The full paper is accessible from the AHRQ website, titled Using Lean Six Sigma Tools to Compare INR Measurements from Different Laboratories within a Community.